In VRInvestigation, you play as a detective looking for clues in order to find the murderer of four persons between seven suspect. The game is finished and ready to play! In each room of the three leveled house, you will find clues and furniture you can interact with. By pressing E near a clue, you will hear my sensual voice giving you my conclusions about it. By pressing E near a piece of furniture, you will move it to see if a clue is hidden under it. When you think you have the identity of the killer, you will have to answer a quizz: who is the killer, what clues did he left... And for bonus points, try to determine if the other suspects also have something to hide. It was tested by about ten friends and members of my family. The average duration of the game was between 1 hour and 1 hour 30 (quizz included). All the persons that managed to find the identity of the killer did so by checking if each of the suspect's alibi was plausible according to the clues they left. I look forward for your advices and critics. I'll always be there if you have any question! Stay safe and don't get yourself killed in the Rift, or you might end up in one of my next games! The game is completed. However, I would like to sell it 1 dollar, and have no idea where to publish it. Is there an official Oculus Rift game selling platform yet? Or do you guys have any advices for me? And on how to get the attention of as many Rifters as possible? what did you use to make the game? you cant just "want to sell it for 1$"
1) Use something like http://gumroad.com to host and sell your game. The website is really nice, discovered it today. Could make selling games directly to customers a breeze. Only problem I see is that it only supports credit card as payment method (no PayPal, etc). Anyway, there may be other sites like that which meet your needs. 2) Once you've got it up and ready to sell, add your game to the Rift app directory sites like riftenabled.com, theriftlist.com, stv.re, and plug your game on these forums and reddit/r/oculus or wherever you want? Of course, this assumes you're good with all your licenses and can legally sell it. I would certainly pay $1. Thanks for the tips, will definitely try that! Yep, just received the positive answer for my commercial licence for UDK, so I'm all good with the law! Do I get my money back if I dont think you have a sensual voice ? YOu can always sell it on the respective OS's app store. Windows 8, OS X App Store, etc. I'm proud to announce you that the game is now available! And I also edited my first post. Go try it, and report back with your questions and/or feedbacks. Haven't gotten a chance to play it since the Oculus isn't taking. Its stick to Monocam. Also, I know its $1, but maybe you should set up a custom menu. It does break a bit of immersion seeing the general UDK menu with Instant Action and so on. Its easy to set up a menu. Just follow one of the many tutorials online to set one up. Can't wait to dive into this once we find a fix to the Monocam issue. Sometimes the game doesn't recognize the oculus at the start. Type ` (the tilt button) to open the console. This worked all the time for me, let me know if it fixes your problem. Clues Storage: When you interact with one, the arrow should disappear and stored in some polaroid interface. Because of the resolution of the Rift, I think using polaroids with large text at the bottom of it describing what it is would help a lot. You can navigate the polaroids like a horizontal slider (think Apple Mac OSX Coverflow). Interacting with a selected polaroid will play the voice/dialog for that object. Clue Highlighting: Its sometimes hard to 'use' a clue as pressing the X or use button won't activate anything unless you are in a specific position. I think if you remove the arrow objects and have objects that can be interacted with highlight, then it would be perfect. Anyways, I enjoyed it. I'm not going to confirm my idea of who the killer is yet, but I'll give it another look later. Oh and I love a lot of those easter eggs. You have a lot of great ideas. Definitely going to work on these during the next weeks. Cool that you enjoyed it! I had the problem of oculus not being recognized at the start. Yes your suggestions on stereo on and hmdward on fixes it. But i still have the problem of the game being within window and not covering the entire screen (full screen). Because of it i see my desktop screen on the sides and taskbar at bottom and it doesn't feel immersive enough. Hope what I am saying making sense. It does, but i've heard people having this problem with udk games in general. Have you for exemple tried rift coaster without having this issue? Thete is right now a thread about this on reddit oculus, you should look at that. Also search for a console command that would turn full screen on. I ll also look for a solution. Set your native screen resolution to 1280x800 then run the game. That should fix the problem, at least it did for me. That makes sense. That's the resolution of the Oculus. You don't have this problem with the games that are done with Unity, as you can choose the screen resolution before starting those. But UDK doesn't have that option. Thanks. Setting the native screen to 1200X800 fixed the problem for me too. 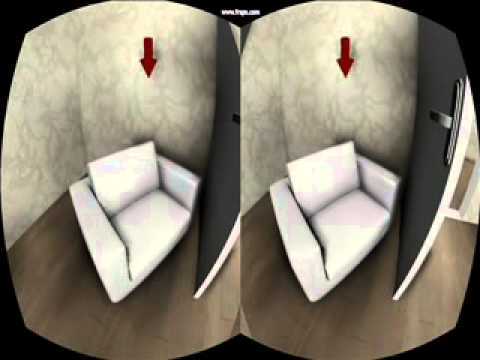 Though the game is still within the window, when i view in the oculus it is fully immersive and i dont see the edges and bottom of my computer. And as someone mentioned i had the same problems with other UDK demos but i haven't tried them with modified screen resolution yet. I found it funny that someone somewhere complained about the UNity version being inferior. haha Being able to play in full screen without 1280x800 on top of antialiasing, the games look great. I've only seen the pixel jumping and jumble from aliasing in the UDK demos which give me a headache. Too bad options are handled through developer control and not some open runtime window. You can send 1 dollar to my paypal [email protected] and I'll PM or email you a link to get the game. I just finished the first update for VRInvestigation. logo, a play and an exit buttons. whenever you want to reread the instructions. Sorry, I just saw your message. -is your oculus plugged in? -are you able to prompt the console? Do any of these commands do anything? New update for the game!